HTC ANC (Free): This isn’t a fair comparison as these earphones come bundled for free with modern HTC phones, but it does demonstrate that not all ANC implementations are equal. From a design standpoint, the HTC earphones are even more streamlined, interfacing through the USB-C port of the phone. As such, they lack a control box entirely as the phone does all the processing. However, while they do passively block some sound, they barely cancel at all, essentially just introducing hiss into the sound, I wouldn’t use these on public transport yet alone a plane. And speaking of sound, these are exceptional for a packaged earphone, but better sound quality can be found from something like the $15 Xiaomi Pistons 3 yet alone the $150 1More. As expected, the 1Mores sound a lot better, they have better end to end extension, far greater balance and clarity and are much more detailed throughout; it’s not really worth breaking it down further as there is no competition. Of course, the bundled earphones are perfectly useable and they do have some unique and innovative features that I would like to see further developed, but there is better performance to be found elsewhere and you don’t have to pay nearly the $150 asking price of the 1More’s to find it. That said, if you do, the 1More’s will provide a huge upgrade in every regard and their beefed up build will be sure to last magnitudes longer. OVC H15 ($50): The H15 is considerably cheaper but its performance is admirable considering. It does not portray nearly the same level of tonal balance or build quality that the 1More is capable of but nails the essentials. Both are also perfectly comfortable over longer listening though the 1More is perhaps slightly more so due to its shallow fit. Sonically, the 1More Dual Driver holds a large advantage. The H15 is very balanced during home listening but its sound is sterile and lacking low-end fullness when in a remotely louder environment. The H15 has a relatively cool bass tone that can easily become drowned out when ambient noise is higher whether bass boost is enabled or not. The Dual Driver ANC has more warmth and extension, producing fuller bass with greater impact if greater bloat. Mids aren’t as clear as the OVC, but they are considerably more natural. The H15 similarly has extra treble energy though it is also very thin due to some peakiness and a lack of lower foundation, the 1More is more detailed and realistic as a result. That said, the H15 easily has the best high-frequency extension and air though this can fatigue when listening at louder volumes. 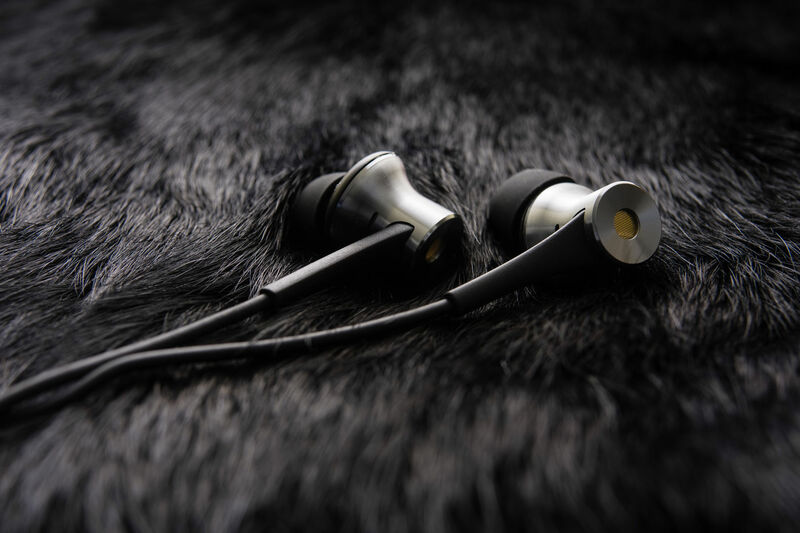 ADV 747 ($60): Advanced Sound’s newest in-ear is similarly very cost effective and though its aluminium build still doesn’t eclipse the almost jewel-like 1More, they are a solid and compact noise cancelling earphone with similarly strong ergonomics. When it comes to listening, the Advanced balances its weaker low-frequency noise attenuation with a considerably stronger bass boost and it is considerably less balanced as a result. Both are more mid-bass focused, though the 747 has greater emphasis in addition to more sub-bass slam. That said, the more balanced 1More is a lot more defined and far tighter within its lower-frequencies where the 747 is less articulate, tending to drone. Mids are also notably more recessed on the 747 and they do lack the extra crispness and energy of the 1More within their treble which dampens the finer details. The 747’s midrange isn’t veiled but it is very warm with a lot of thickness pervading throughout both its upper and lower midrange. The 1More has a huge clarity and balance advantage, sounding more natural and realistic. Still, the 747’s thick presentation works in a louder environment but they do miss a lot of the resolution and clarity of the 1More and can sound congested. The 747 is more rolled off within the treble and, as aforementioned, is lacking lower-treble attack. As such, they aren’t as crisp and concise as the 1More’s and lack the same detail retrieval and separation. Bose QC20 ($250): The Bose is the most expensive but also the most tried and tested. It has an admittedly mediocre plastic build, especially when compared to the 1More, but fit is terrific and the earphones are well constructed nonetheless. The Bose pioneered the warm, smooth traveller sound that almost every modern ANC solution carries. That said, it does not necessarily have the best execution and the 1More is once again more balanced and more revealing overall. This starts with the bass response that is slightly warmer and fuller on the Bose. However, the Bose also has a notable upper bass boost that grants them a somewhat tubby sound where the 1More’s is cleaner, tighter and more defined within its low-end. Lower mids are warmer on the Bose and clearer on the 1More, both have more enhanced upper midrange clarity though the Bose sounds unrefined and lacking extension compared to the 1More. The Bose also has just a hint of extra lower-treble crispness to heighten engagement without compromising long-term listenability, but it doesn’t have the edge and attack of the 1More. Neither extend well into the higher-frequencies with truncated air and distant to non-existent upper-treble elements. Simgot EN700 Pro ($150): The Simgot represents one of the best warmer non-noise cancelling in-ears around the same price as the Dual Driver ANC. The Simgot has a similarly impressive all metal build with a semi-open design providing average noise isolation that doesn’t touch the 1More’s potent ANC. They feature a removable cable that can be upgraded or replaced in the event of damage where the 1Mores are fixed to the housings. The Simgot’s are immediately a more balanced earphone, best suiting listening in quieter environments. However, as a result, they are considerably more resolving with better end to end extension, separation and higher definition. Bass is similarly tuned but tighter, more balanced and more agile on the Simgot. The Simgot has more present mids with greater clarity and more neutral body that better adapts to different genres of music. Highs are also more prominent on the Simgot, both have some extra lower treble crispness and are laid-back but the EN700 Pro has far better extension. As a result, it is more separated with greater resolution, they resolve a lot more detail and present a much larger stage. That said, I have no doubt that many will enjoy the bassier, warmer 1More and they do provide significantly more isolation from external noise, these are two vastly differing earphones designed for very different uses. 1More Quad Driver ($199): I’m sure many are also curious how the Dual Drivers compares to 1More’s own flagship in-ear, the Quad Driver. From the outset, the jet-engine shaped Quad Driver is more visually striking with superior finish and a stronger, smoother cable. The Quad Driver also has a shallow, comfortable fit though it is heavier and less stable in the ear. The Quad Driver provides average isolation like the Simgot, the Dual Driver attenuates far more external noise and sounds much better in louder environments as a result. In listening, the Quad Driver is immediately more balanced but also less coloured, its sound is more detailed and resolving but can be considered less engaging. Bass is most notably different, the Quad Driver is quicker with a tighter sub-bass response and it is considerably more defined as a result. That said, it also lacks the mid-bass impact of the more emphasized Dual Driver. Mids are inverted, the 1More has more vocal presence and greater resolution though it is darker and the Dual Driver actually has greater clarity as a result. Treble is similarly tuned, but the Quad Driver extends further before rolling off. Both have a crisp lower treble but the more extended Quad has greater shimmer and air up top. As such, the Quad Driver is the more linear, even earphone, producing a much more detailed sound and a larger stage. It also has very three-dimensional instrument placement that is a standout at this price point. As expected, these earphones were designed for very different uses and this is reflected by their respective sounds. The 1More Dual Driver ANC fuses a sturdy, premium build with potent noise cancellation and a warm yet expressive sound. Though one of the most expensive models out there, the 1More is a little over half the price of competing models from Bose and offers similar levels of low-frequency noise attenuation in addition to significantly enhanced sound quality. The same can be said with regards to more economical options from Advanced Sound and OVC. They are cheaper and the Advanced actually blocks higher frequencies better, but none demonstrate the same level of build quality and sonic finesse as the 1More. This isn’t a cheap earphone nor is it a resolving reference masterpiece when it comes to sound. Rather, 1More’s ANC in-ear is built for the commuter with an opulent yet perfectly ergonomic design and great active noise cancellation. To top it off, the Dual Drivers carry a sound that is incredibly well considered towards their intended uses, completely devoid of fatiguing peaks or unnatural troughs without sounding dull or boring. Their streamlined ANC box and innovative joystick controls also serve to enhance user experience. This is an earphone that will be sure to keep users engaged whether it be a short train ride or an extended plane trip. Verdict – 8/10, 1More’s active noise cancelling in-ear isn’t the most isolating solution on the market nor is it the most economical, but its strength stems from its combined attributes that form an astonishingly complete package. This isn’t an earphone for critical listening but it is a great option for frequent travellers wanting a detailed sound without sacrificing low-end fullness or external noise attenuation.